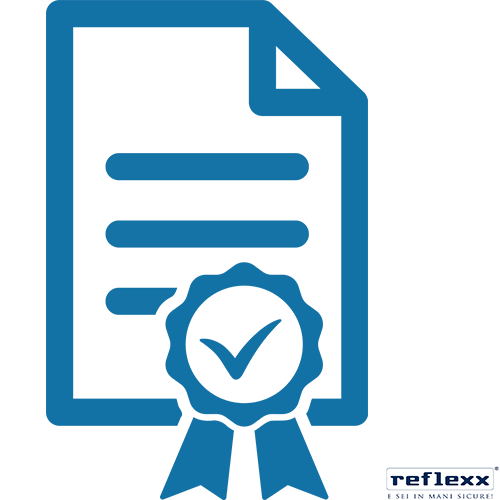 REFLEXX S.p.A. designs, develops and manufactures in collaboration with the best manufacturing companies in the Far East, Reusable and Disposable Nitrile, Latex, Vinyl and other innovative materials Gloves. Our mission is to provide effective and efficient gloves for professional use, gloves which have maximum protection and performance. We also pay extreme attention to product consistency, something which we consider as a major value of our production. There is a continuous search for innovative products and materials that can offer the best protection at the lowest possible cost. FCM (Food Contact Materials) EC Regulation 1935/2004 / EEC and Regulation EU10 / 2011, Decree 777/82, Decree 108/92 and Italian Ministerial Decree of 21/03/1973 and subsequent amendments. HOW IS PRODUCT DECLARED SUITABLE FOR FOOD USAGE? A Product is declared suitable for food when it does not release chemicals in processed foods, i.e. when it is not harmful to health and does not alter the organoleptic characteristics of foods. Therefore, in order to be declared suitable for food, a product must undertake to carry out tests (global migration in food simulants), which mimic glove behavior in contact with all food categories (aqueous, acidic, alcoholic, Milk, Oils and Fats) in accordance with current regulations (Reg. CE 1935/2004, DM 21.3.73, Reg. EU 10/2011 and subsequent updates and amendments). WHAT IS THE GLOBAL MIGRATION TESTING IN FOOD SIMULANTS? These are tests under standardized conditions such as duration, temperature and medium (food simulant), corresponding to the worst predictable use conditions of food contact material. WHAT IS A FOOD SIMULATOR? A food simulant is a chemical test with characteristics similar to the different food categories (watery, acidic, alcoholic, milk, oil and fat and dry foods). Food simulants A, B and C are designated for foodstuffs which have a hydrophilic character and are able to extract hydrophilic substances. The food simulant B is used for foodstuffs with a pH lower than 4.5 and the food simulant C is used for alcoholic beverages with a content of alcohol of less than or equal to 20% and for foodstuffs containing a significant amount of organic ingredients which make them more lipophilic. Food simulants D1 and D2 are designated for foodstuffs having a lipophilic character. D1 simulant food is used for alcoholic beverages with an alcohol content of over 20%; for dairy products and for emulsions of the oil type in water. The simulating D2 is used for food containing free fats in the surface. The food simulant E is suitable for dried foods, but migration trials with this simulator will be mandatory from 2018. WHAT DOES IT MEAN THAT A GLOVE IS NOT SUITABLE FOR WATERY FOOD? WHAT DOES IT MEAN THAT A GLOVE IS NOT SUITABLE FOR ACID FOODS? This means that this product cannot be used in contact with foodstuffs with a pH lower than 4.5 (vinegar, cider, juice or simple or concentrated vegetable juices, fruit nectars, lemonade, syrup, bitter, vegetable infusions, coffee, tea, Non-alcoholic drinks, energy and the like, flavoured water, liquid coffee extract, preserves, yogurt, feta, mozzarella, mayonnaise, mustard). WHAT DOES IT MEAN THAT A GLOVE IS NOT SUITABLE FOR ALCOHOLIC FOODS? This means that such a product cannot be used in contact with foodstuffs whose alcohol content is less than or equal to 20% (alcoholic beverages (wines, spirits, beer), desserts, processed fruit in the form of puree, preserves or pasta or in its own juice or sugar syrup (jams, compote and similar products), processed vegetables in the form of purees, preserves, pasta or in their own juice, fruits and vegetables preserved in the form of alcohol, preserved fish or meat in aqueous medium, eggs (any form of egg), water-based sauces and ice creams). WHAT DOES IT MEAN THAT A GLOVE IS NOT SUITABLE FOR DAIRY FOODS? This means that the product cannot be used in contact with foodstuffs such as whole milk, partially dehydrated milk and partly or wholly skimmed milk and beverages, fermented milk such as yogurt, dairy products and similar products, cream, melted cheese (soft cheeses, cottage cheese and the like) , Cheese preserved in aqueous medium (feta, mozzarella and the like). WHAT DOES IT MEAN THAT A GLOVE IS NOT SUITABLE FOR OILY AND FAT FOODS? Fat, such as bakery, biscuit and pastry products with fresh, surface fat, chocolate and substitutes, confectionery with surface fat, fruits and vegetables preserved in oily medium. Confectionery in the form of pasta or cream, animal and vegetable fats and oils, natural or processed (cocoa butter, lard, melted butter, margarine, other than fruit, nuts, nuts, cherries, almonds. Products other than fatty character (preparations for soups, broths or liquid sauces, solid or in powder form; Homogenized composite food preparations, ready-made meals, including yeast and yeasts), fatty sauces (mayonnaise, salad sauces and other oil / water emulsions, for example coconut sauces), champagne, sandwiches, pizza and toast Having fats on the surface, cocoa paste, spices and aromas in an oily medium such as pesto, curry pasta). 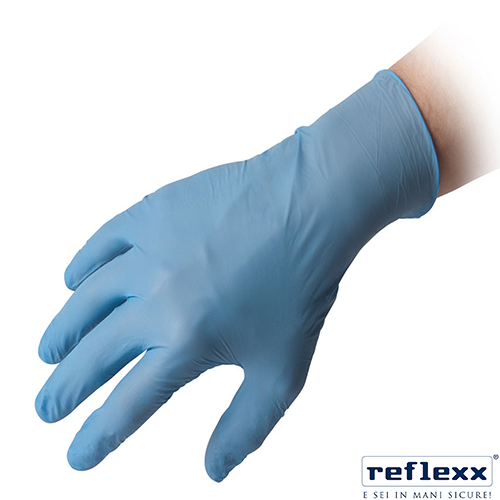 DO THE REFLEXX GLOVES DO COMPLY WITH PRESENT MEDICAL AND SAFETY NORMS (93/42/EEC AND 89/686/EEC)? 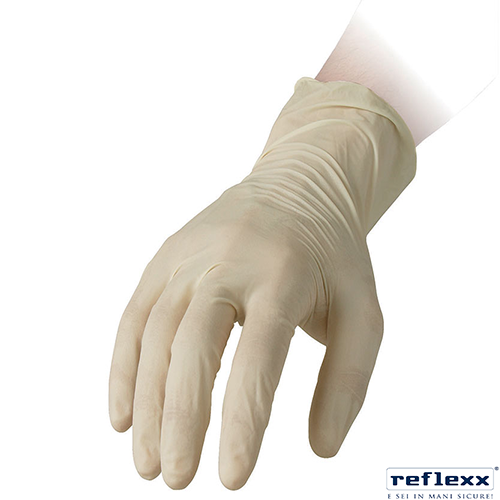 Yes, the Latex and Synthetic gloves, disposable and re usable, Nitrile and Vynil comply with the various present norms in force in the Medical (93/42/EEC) and Safety (89/686/EEC) sector. For further information do not hesitate to contact us. We will be at your disposal with expertise and know-how.